"Sonic the Hedgehog 2" and "Sonic 2" redirect here. For the 8-bit version, see Sonic the Hedgehog 2 (8-bit). For the remake, see Sonic the Hedgehog 2 (2013). For similarly-titled media, see Sonic the Hedgehog 2 (disambiguation). 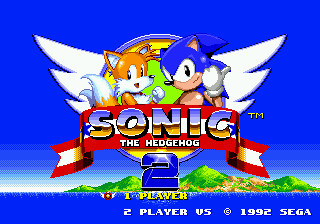 Sonic the Hedgehog 2 (Japanese: ソニック・ザ・ヘッジホッグ 2) is the highly successful sequel of the original Sonic the Hedgehog for the Sega Mega Drive. Put into development not long after the completion of the first game, the title would go on to become one of the most successful video games of all time, selling millions of units and cementing the franchise as a cultural phenomenon in the west. Introducing Miles "Tails" Prower in the role he was created for, the game was released worldwide on November 24th, 1992. Dubbed "Sonic 2sday," the simultaneous release was an unusual move for the time. The game eventually replaced the original Sonic the Hedgehog as the default pack-in title for the Mega Drive, being bundled with the redesigned Mega Drive II model. The game is also the first in the "Death Egg Saga", a storyline that would continue in the sequels Sonic the Hedgehog 3, Sonic & Knuckles, and Sonic the Hedgehog 4. A few days after landing, Sonic realized that he was being followed by someone. Looking behind him, Sonic spotted a young fox, who immediately hid from the blue hedgehog when he looked his way. Not thinking much of it, Sonic ran off, the fox once again following. The young fox's given name, Miles Prower, was overshadowed by his nickname, "Tails," derived from the fact that he possessed not one but two tails behind him. Often being ridiculed by his peers, "Tails" outlook on life changed immediately once he spotted Sonic running around his home, deciding that he had to follow and emulate his new hero, wanting to be just as cool and confident. No matter where Sonic would go, Miles would try and follow, Sonic eventually accepting the near-constant trailing of the young fox. Not long after, during a brief moment when "Tails" was exploring the beaches of West Side on his own, he came across the Tornado, glittering in the sun. Spotting it in the distance, he became extremely excited, running as fast as he could towards it. Engrossed in its design, he wondered who the plane belonged to. He didn't have to wait too long when, out of the corner of his eye, the fox spotted the distinct image of Sonic, taking a nap under one of the wings. This newfound knowledge was not given much time to process in "Tails" mind when suddenly a loud explosion echoed through the air, shocking Sonic awake. Looking beyond the Emerald Hill Zone, a large pillar of fire could be seen, accompanied by a new, yet familiar, army of mechanical robots. It only took a second for Sonic to guess who had caused the explosion, cursing Eggman's name and running into the thick of it. Without hesitation, Miles Prower followed behind, knowing that he had to be right at Sonic's side. His laugh echoing in the wind, Eggman couldn't help but gloat over his newest plan, being grateful for having the foresight to follow Sonic to West Side Island. Learning of the legend of the island, Eggman came to the realization that the legendary stones talked of could only be the Chaos Emeralds, this island being the true resting place of not only the six from before, but of a seventh as well. Once again wanting the emeralds for himself, Eggman plans on using them to power his latest creation, the Death Egg, a flying fortress orbiting the planet with the potential to be his greatest weapon. With the desire to rule the world fueling the mad doctor, he prepares to once again engage with his greatest enemy, the one force that could possibly spoil his plans. "The stage is set. Now it's time for you to bring the curtain to a close on this adventure once and for all!" Sonic and "Tails" facing off against Dr. Eggman in his redesigned Eggmobile. Building upon the engine from the first game, Sonic the Hedgehog 2 kept to the same basic formula as the first game: to overcome a series of obstacles and enemies and reach the end of each "Act," all under the span of ten minutes. Many of the elements that made the first Sonic the Hedgehog unique return, such as the loop-de-loops and curved slopes, while introducing new hazards and level elements like the corkscrews in Emerald Hill Zone and the slot machines in Casino Night Zone, placed inside areas taking full advantage of the pinball side of the physics. With the exception of Metropolis Zone (which has three Acts) and the final three zones of the game (which are one act each), each zone only possesses two acts, although each act in this game is larger than the acts found in Sonic the Hedgehog. The main form of attack for Sonic is the same as the first game, the ever trusty spin attack that Sonic curls into each time he jumps. Able to hit enemies from any angle as long as spikes or some other projectile is not in the way, he can also curl into this spin on the ground in the same way, by the player pressing down on the control pad as he runs along the terrain. However, the game also introduces a new way to gather up speed in this form without having to build it up. The spin dash, which has since become a staple of the series, allows Sonic to rev up in a static location before he fires off, either destroying enemies in his wake or giving him the momentum to slide up steep slopes and reach higher areas of each level. By pressing and holding down while tapping the jump button, letting go of the control pad allows Sonic to zoom ahead, Dr. Eggman's forces being no match for the blue hedgehog. Sonic and "Tails" caught up in the Casino Night Zone. As both the title screen and the story suggest, a new character is introduced in the game. Miles "Tails" Prower, by default, follows Sonic around automatically, emulating each move you do. Sometimes helpful and sometimes baffling, he is also given an infinite number of lives, so if you're able to just miss a hazard with Sonic but "Tails" is less than fortunate, he will return to the screen, using his namesake to fly from the top of the screen down to where Sonic is standing. He also uses this method to catch up to Sonic if the player is fast enough to lose the two-tailed fox. If a second controller is plugged in, another player can control "Tails," making Sonic the Hedgehog 2 the first game with "1.5 player" play. Although given the flying animation, the other player can not activate "Tails" flying ability, nor can they jump on the various monitors that litter each zone. The infinite lives count, however, remains. In the options menu to the game, having "Tails" follow you can be turned on or off, the game also giving you the option to play as "Tails" by himself. Though he can now break monitors when alone, he still can not fly, and must follow the same rules of extra lives as Sonic does in the main game. Special Stages and Chaos Emeralds return in this game, although both how you access them and how you play through them are completely different from the first Sonic the Hedgehog. The only way to activate them is by hitting the checkpoints in this game, which are Star Posts instead of Lamp Posts. If the player possesses fifty rings while touching the post, a ring of stars will appear for a short time, jumping into them transporting Sonic and "Tails" into the Special Stage. A three-dimensional-esque half pipe that can feel like a roller coaster, the object is to collect the number of rings the stage announces at the beginning. Each stage is broken up into three parts, and if the player successfully collects rings for all three tries, they will be awarded with one of the Chaos Emeralds. While the last game only had six, Sonic 2 raises the total by one. And while the Chaos Emeralds are not completely necessary to beat the game in a simple run through, they are still needed to view the true ending of the game. As an added incentive, the team behind the game decided to give the players a bonus for collecting all seven Chaos Emeralds. After finding the seventh, and then collecting yet another fifty rings in a zone and jumping up, Sonic will transform into Super Sonic, a golden-hued, buffed out version of the original who is both invincible and super fast. The only downside, though, is the transformation is temporary, and drains Sonic's ring count, returning to his original true blue self once all the rings are gone. Being the second in the series, the team behind the game decided they would try their hand at a competitive, two player mode. Taking the Emerald Hill Zone, Casino Night Zone, Mystic Cave Zone from the main game, throwing in the Special Stages, and giving the main levels a unique soundtrack for the mode, each player controls one of the main characters to the game as they traverse a split-screen form of these classic levels. With Sonic on top and "Tails" on the bottom, they are graded on five criteria for each act: Score, Time, Ring count at the end of the act, Total Ring count (including those lost by being hit), and number of Item Boxes popped open. The player that wins the most out of those five takes the round. Though the standard item boxes from the game are present, there are two that are unique to this mode. The first is a teleportation box, which will switch Sonic and "Tails"' position on the map. The second is an Eggman monitor, that will cause whoever pops it open to take a hit. As every monitor on-screen is only static, it is always random as to what will be found inside each monitor. Also of note is that the extra lives in the item boxes are not determined by which character opens it, but by which character's face shows up, so it is entirely possible for the player being Sonic to give "Tails" an extra life, and vice-versa. As each zone only contains two acts, if a tie occurs it will be decided by the competitors in a Special Stage. As these play different from the rest of the game, the only criteria that is graded is the ring count at the end of each segment, the stage still split up into three "rounds." The best two out of three takes the special stage, and subsequently the zone. Even if there are no ties during a run through the two player mode, the Special Stage is still one of the four levels to be chosen during the mode, the same rules applying to it as the other Special Stages. The player who wins the most out of everything is, naturally, the winner. For those who want their two-player encounters to be even crazier, an option is available to change every monitor in the game to a teleportation monitor. Hitting Bumpers: 10 points each for the first ten hits on any given bumper; after that no more points can be gained from that bumper. End Level Perfect Bonus: The game stores a list of how many rings are present in each level. Each time you get a lone ring, the game subtracts one from this value. If this value is 0 when you pass the end signpost, you receive a 50,000 point bonus. Super Ring boxes and those placed by debug mode do not affect this counter. Getting hit by an enemy and losing your current rings does not reset the counter. There are also green, yellow, and red bumpers in sets of three. Hitting one is worth 10 points and causes the bumper to change color (green -> yellow -> red -> disappear). Destroying the third red bumper in each set of 3 is worth 500 points instead of 10. The sound test in Sonic the Hedgehog 2. Below is a listing of the songs available to play through the game's sound test, accessible through the level select code. 6,000,000 Sonic the Hedgehog Retrospective, Part 3 (Not viewable in the US.) Sega Mega Drive N/A These sales data numbers make Sonic the Hedgehog 2 (16-bit) the second best-selling game for the Sega Mega Drive / Sega Genesis console, second only to the original Sonic the Hedgehog (16-bit). The game waits until the DMA is completed. Fixes a typo with the name "THOMAS KALINSKE". Fixes a bug where the ring monitor ignores the 999 ring cap. Fixes a bug in 2 player mode where the mappings are broken Sonic and Tails are swapped by making them invisible. Tries to fix a crash by placing an object in debug but it doesn't work. Strangely this revision adds a "nop" before the Ring Manager. Different object positions in this build. Changed a branch to "Obj02_ResetLevel_Part3". Invisible Solid Blocks are strangely no longer visible in debug. Invisible MTZ plates are strangely no longer visible in debug. Fixes a bug where the player can bounce off MTZ plates while hurt or dead. Game now checks if the player is hurt in "Obj85"
Changed some duplicate PLC entries. Intersting 2 bugs are exclusive to this version. Note: This will only apply to the game specifically. REV02 released as a part of Sonic Classics contains all of the changes from REV01 and Some more. Removes a bunch of JmpTo commands improving performance. Some add/sub commands are optimized to addq/subq. Some instructions now use pc-relative addressing, instead of absolute long. Fixes a bug where the WFZ background doesn't stop scrolling up after you get a time over during the cutscene. Removed some unused background scrolling code. Removed a branch to "Obj02_ResetLevel_Part3". 1MB 1992-09 Sonic Compilation Hack; extracted from Sonic Compilation. Assumed to be v02. Sonic the Hedgehog 2: Mega Drive Official Guide Book - Contains a short comic based on the story to Sonic the Hedgehog 2, by Sango Morimoto, one of the artists for the Sonic the Hedgehog manga. This page was last edited on 20 March 2019, at 20:16.